OTTAWA -- Prime Minister Justin Trudeau is bringing his feminism to the G7 summit next year, which could involve stirring up the issue of sexual and reproductive health rights at a time when U.S. President Donald Trump is far from being on the same page. That could be a difficult issue, just as it was at the G7 summit in Sicily this year, the source acknowledged. 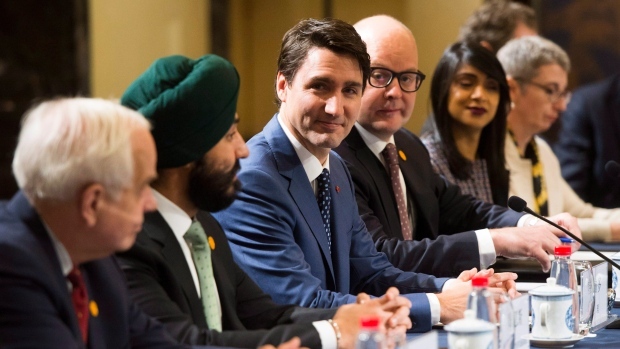 But the Liberal government is planning to convene an advisory council on gender equality -- including members of civil society from all seven countries -- that could help pave the way. Lauren Dobson-Hughes, a gender and global health consultant, said she is excited about gender issues being such a big part of the agenda, but concerned that things like sexual and reproductive health rights could end up falling off the road to consensus. "The risk is you end up with a split where the U.S. goes offside and does its own statement or communique or, on the other side, you just risk watering down the communique to basically nothing," she said. "How do you still make advances while holding the line and not giving anything up?" Oxfam Canada's Diana Sarosi said it will be important for the Liberals to include feminist organizations in all sorts of G7-related discussions and not just on topics traditionally linked to gender. "Women have opinions about trade. They have opinions about finances and so son, so these topics that are not generally regarded as women's issues are women's issues," said Sarosi, the women's rights policy and advocacy specialist. Julia Kulik, director of research for the G7 Research Group at the Munk School of Global Affairs at the University of Toronto, said she expects to see a heavy focus on the economic aspects of gender equality, such as pay equity and the burden of unpaid work. Still, she said it is important to recognize just how strong the push by civil society to include sexual and reproductive health rights has become. "It's almost detrimental to the whole gender equality aspect of the communique if you don't include it." The Liberals also plan to put the whole G7 exercise through a gender-based analysis, which involves thinking about how a certain policy might affect men and women -- or boys and girls -- in different ways, along with taking age, income, culture, ethnicity and other intersecting factors into account. Rohinton Medhora, the president of the Centre for International Governance Innovation, said that just as the G7 grew beyond its initial focus on macroeconomics to address security after the terrorist attacks of 9/11, it also makes sense for the institution to turn its attention to social issues. "If you're thinking of populism and the ill effects of excessive globalization," he said, "then it's very easy to tease out important gender dimensions."